Central Jakarta Social Sub-dept. has distributed aid for fire victims on Jalan Tanah Tinggi I, RT 01-03, RW 02, Tanah Tinggi Urban Village, Johar Baru. Currently tens of residents are still in shelter.
" We distribute various aid for their temporary needs"
Central Jakarta Social Sub-dept. Head, Susan Budi Susilowati said, her side has distributed aid for fire victims, especially food. "We distribute various aid for their temporary needs. I hope this can ease their burden," she conveyed, Wednesday (6/27). Aid her side provided are 150 kilogram of rice, 15 cartons of instant noodles, and 144 food packages. While for shelter, her side provides 55 tarpaulins, 200 sheets of blanket, and 100 mattresses. "We also provide 32 social packages for children, 18 social packages for elderly, 22 boxes of underwear, 186 elementary school uniforms, 25 junior high uniforms, and 25 senior high uniforms according to urban village request," she said. 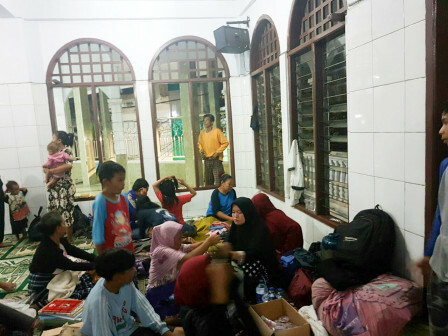 There are 50 of 82 fire victim families who are still staying in shelter and Annur Mosque at RW 02. While the others are staying in their neighbor houses or their close relatives.